Garry Shandling, who as an actor and comedian pioneered a pretend brand of self-focused docudrama with "The Larry Sanders Show," has died. LOS ANGELES (AP) — Garry Shandling, who as an actor and comedian masterminded a brand of self-inflicted phony docudrama with "The Larry Sanders Show," has died of an apparent heart attack. Shandling's spokesman Alan Nierob said doctors at a hospital where the comedian was pronounced dead said it appeared he died of a heart attack. Nierob said Shandling had no history of heart trouble. Coroner's Lt. David Smith said it appeared Shandling died of natural causes, but an official cause of death determination had not yet been made. Smith said no autopsy was planned, but officials would determine Shandling's cause of death based on medical records and his medical history. Shandling was taken to a hospital after paramedics were dispatched to his Brentwood home around 10:40 a.m. Thursday, police and fire officials said. His death stunned the comedy community, who praised Shandling's humor, kindness and efforts to support and promote them and their craft. "The answer isn't gonna be in the facts," he told The Associated Press in 2009. "It's gonna be in intuition. That's how I work creatively. I'm always teaching people that the answer to that creative question is right here, in the room, between us here." Then in the 1980s, he began to experiment with TV comedy, and to toy with the sitcom form, with his first series, "It's Garry Shandling's Show," a Showtime project that made no bones about its inherently artificial nature: The actors in this otherwise standard domestic comedy routinely broke the fourth wall to comment on what they were up to. 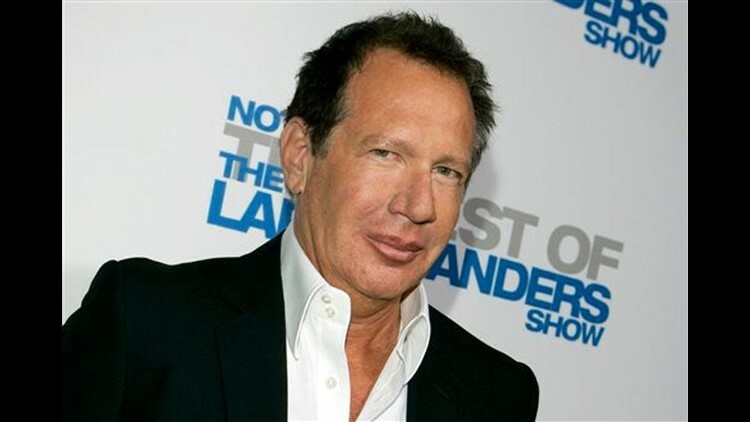 Even the theme song began with the explanatory lyrics, "The theme to Garry's show...."
Then, in August 1992, Shandling created for HBO his comic masterpiece with "The Larry Sanders Show," which starred him as an egomaniacal late-night TV host with an angst-ridden show-biz life behind the scenes. It was just three months after Johnny Carson had retired from "The Tonight Show," where Shandling had appeared as a stand-up and occasional Carson stand-in. It seemed a wry but deeply felt homage to the King of Late Night. But it was more. "Larry Sanders" proved to be an act of courage, a brave effort led by someone portraying a character dangerously close to himself. As Larry, Garry dug deep to confront his own demons, and did it brilliantly as the series teetered between dual realities: public and private; make-believe and painfully true. Real-life celebrities appeared as guests on Larry's show-within-the-show, and also interacted with him "off the air." "Are you doing a bit, now?" asked Larry, perplexed. "We're OFF the air," Carrey hissed. "This is real life now." The show explored the fuzzy distinction between TV life and real life, and the loneliness of someone at its crossing. The closest thing Larry had to friends were his chronically needy announcer Hank (Jeffrey Tambor) and his Napoleonic producer, Artie (Rip Torn). Together the three actors were among TV's best-ever trios. "Garry was my dear friend and was and always will be my teacher," Tambor wrote in a statement. "Garry redesigned the wheel of comedy and he was the kindest and funniest of Geniuses. I will miss him so much." Torn also expressed deep sadness about Shandling's death. "Working with him was one of the great privileges of my career," he wrote. "He was a comic talent of immense originality who enthusiastically encouraged and responded to the originality of others." After "Sanders" ended in 1998, Shandling's public appearances were few. He was mentioned as a candidate to follow David Letterman as a bona fide late-night host for CBS' 12:30 a.m. slot, but no deal was made. "I would not do a show where you just sit and talk to somebody," Shandling had said back in 1993 when he was courted by NBC to take over for Letterman on "Late Night." His films included "Hurlyburly" in 1998, "What Planet Are You From?" in 2000 and "Zoolander" in 2001. On the latter occasion, he spotted Donald Trump in the audience and congratulated the billionaire developer for hosting the Emmy-nominated "The Apprentice." "Nice to see a man who's paid his dues, worked hard," Shandling said. "We all know what it feels like to have to build 80-story condos and gambling casinos just to get our foot in the door in show business." Jamie Masada, owner of comedy club the Laugh Factory, said he met with Shandling a few weeks ago and the comedian didn't appear to have any health problems. "He looked healthy as could be," Masada said. "Garry Shandling, besides being a comedian, I always said he was a doctor of soul. He had a lot of kindness in him. He was a very generous person," Masada said. While Shandling never married, his most public romance was with "Sanders" co-star and fiancee Linda Doucett, who played Hank's comely assistant in the series' early seasons. The news of Shandling's death brought an outpouring of reactions from performers who spoke of his impact. "Garry was a guiding voice of comedy," said actor-comedian Bob Odenkirk. "He set the standard and we're all still trying to meet it."